It is a sweet time when you can get away with some of your best girls for a little get away. Recently, I got to do just that when my friends, Merri and Julie, and I made plans to meet Lu in Nashville. Since our Sherri lost her battle with multiple myeloma and Lu moved to Tuscaloosa, Three Friends and a Fork has been a lonely place and I am excited any time I can manage to get together with my friends. Merri booked us a room with Air BnB, which none of us had ever used before, but the price was about one-third that of hotels in the area. Our room turned out to be a three level town house belonging to a couple in downtown Nashville. We were super impressed with the location. None of us would have ever stayed in the place by ourselves, because we were actually staying in the home the couple lives in, not a separate rental apartment. But, for the three of us staying together, we were perfectly comfortable sharing the upper level of this Nashville home. If you are thinking about renting space in an Airbnb, you need to ask about the accessibility of the space you are planning to rent. We had to climb stairs to the top floor, carrying our suitcases and belongings. It would have been difficult, if not impossible, for anyone with health or mobility issues. I learned a few things about Nashville during this trip. First. Uber will be your best friend in Nashville. Truly, it is the only way to get around town. We would put in our request on the Uber app and it would tell us exactly where our driver was and how soon transportation would arrive, which was usually in minutes. I had no idea Uber was so spectacular. So, #1, get the app. Use Uber. Next, Nashville has a ton of great restaurants and they stay booked. I'm not kidding when I say 2 1/2 hour waits were the norm. For some really iconic restaurants, like Husk, you can forget getting in unless you have reservations, preferably weeks, if not months, in advance. Seriously, we tried to get reservations to Husk the week before we left home and could not get in. #2 Make dinner reservations well in advance of your trip, if there are places you really don't want to miss. There are always lots of things going on in Nashville and many of them are free. If there is a show or event you really want to see make reservations before you leave home, but don't forget to check out the other things Nashville has to offer. For instance, we had a blast listening to great honky tonk music in a place called Robert's Western World. There is no charge to get in, but the band does pass around a bucket for tips. Speaking of the band, they were wonderful. They entertained us with real country favorites by Hank Williams, Patsy Cline and Bob Wills, among others. If you want something to eat or drink, that will cost you, but the entertainment is free. This little guy was watching over all the festivities at Centennial Park. We were also thrilled when we found out the Tennessee Arts and Crafts Fair would be going on at Centennial Park the days we were in town. Tons of vendors set up shop and sell their handmade goods in the shade of the trees at Centennial Park. Admission is free and so is looking, but don't be surprised if you decide to buy something while you are there. #3 Book your shows and other paid events before you leave home, but don't forget to check out all the free things going on in the Music City. Finally, back to that Airbnb. I never thought I would recommend this, because the idea of staying in a stranger's home kind of creeps me out, but hotels in downtown Nashville can be quite pricey. If you are traveling with a group and you would feel comfortable staying in a private residence, at least give Airbnb a look. The place we stayed in was clean, we barely saw the couple who lived there, and the location was the best we could have asked for. Best of all, we saved a ton of money. #4 Check out Airbnb. Those are my tips. Here is our trip! We arrived on Thursday night, which just happened to be Cinco de Mayo. We stupidly thought we might check out the Mexican restaurant, Saint Anejo, in the Gulch. Not only did Cinco have the place packed, it just so happened that Kid Rock was there. It was almost impossible to drive down the street in front of the restaurant. Giving up on Saint Anejo, we finally wrangled a table, with the OpenTable app, at The Southern and we were not disappointed. I knew right away that The Southern was a sister restaurant to Saffire in Franklin when I saw a Devil of an Egg on the menu. A previous trip to Franklin with the family had introduced me to those yummy smoked deviled eggs. It's a Devil of an Egg! But on this night, we skipped the eggs and went straight to the main course. Lu got gumbo with the mahogany roux just like she loves it. She also had another favorite of hers, New Orleans BBQ shrimp. Merri chose a Caesar salad, which we all agreed was the best Caesar we had ever tasted. It had romaine, shaved country ham, herbed goat cheese, croutons, buttermilk Caesar dressing and a blackstrap drizzle. Delicious! Merri and I both had blue cheese biscuits with beef tenderloin and a horseradish demi glacé. Poor Julie, who had a previous commitment, finally made it to Nashville just as we were finishing our meal. Since it was a beautiful night, we ate outside and watched the carriages ride by our table. 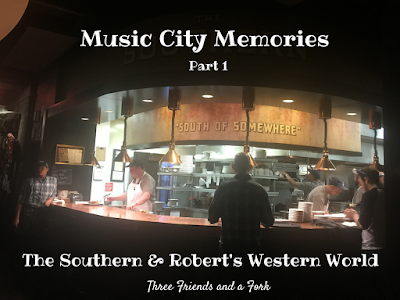 When Julie finally arrived, we moseyed on over to Robert's Western World for some authentic Nashville honky tonk! We really loved that we were carded before we were allowed to enter the bar! No wonder everybody in Robert's is in such a good mood and feeling young! Julie was starving so she grabbed a burger and fries while we were there. She really liked that burger, too! But, of course, the music and the people watching were best parts of Robert's. We literally fell into our beds when we finally made it back to our room. Exhausted, but thoroughly pumped for the next day. More later! 3 Boot Scootin' Yums UP!